Urine specific gravity (USG) and osmolality are measures of the solute concentration in urine and are used to assess the ability of the renal tubules to concentrate or dilute the glomerular filtrate. Knowledge of urinary solute concentration is essential for proper interpretation of urea and creatinine, which are indicators of glomerular filtration rate. A wide USG range is possible in healthy euhydrated animals. However animals that are dehydrated, hypovolemic or have decreased effective blood circulating volume should be conserving water (and trying to reconstitute effective blood volume), therefore concentrating their urine. Thus, in the setting of azotemia or an increased urea and/or creatinine, USG is used to determine whether concentrating ability is adequate and is very useful for distinguishing between causes of azotemia. Antidiuretic hormone (ADH): This is produced by the hypothalamus and stored in the posterior pituitary. ADH opens water pores (aquaporins) in the distal convoluted and collecting tubules allowing for water to be absorbed passively along a concentration gradient established by a hypertonic medulla. This concentrates the urine. ADH also promotes urea absorption, which contributes to medullary interstitial tonicity. Central diabetes insipidus results from lack of ADH, the consequence of which is usually hyposthenuric urine (urine that cannot be concentrated; USG < 1.008). Distal/collecting tubules must be responsive to ADH: In renal disease, damaged tubular cells are less responsive to ADH, which impairs renal concentrating ability (leading to “inadequately concentrated” or isosthenuric urine in animals with renal azotemia). Other extrarenal factors can also result in decreased responsiveness to ADH and these include: Hypercalcemia (various mechanisms proposed), corticosteroids, endotoxins, hypokalemia and hyperammonemia. When tubules are not responsive to ADH (from primary tubular disease or extrarenal factors) it is called nephrogenic diabetes insipidus. Decreased transport of Na and Cl from the ascending loop of Henle to the medullary interstitium (e.g. renal tubular disease, loop diuretics). Hyponatremia resulting in decreased filtered sodium and less available to be absorbed and transported to the medulla (e.g. electrolyte losses in diarrhea). Decreased production of urea resulting in decreased filtered urea available to be transported to the medulla in the descending limb of the loop of Henle and collecting tubules (e.g. liver insufficiency). Increased urine flow rate resulting in impaired reabsorption of Na, Cl and urea (e.g. osmotic or chemical diuresis such as due to diabetes mellitus or excess corticosteroids). Also called medullary solute washout. Increased medullary blood flow in vasa recta: This flushes out the solutes accumulating and creating hypertonicity in the medulla. Hypokalemia and hypercalcemia can both cause this effect. Also called medullary solute washout. For more on how the kidney concentrates urine, refer to the renal physiology page. The interpretation of several urine chemical parameters, such as protein and bilirubin, is also influenced by the specific gravity of the specimen. In addition, urinary constituents (erythrocytes, leukocytes and casts) can lyse in dilute urine (USG < 1.008), affecting interpretation of the urine sediment results. Urine specific gravity is a measurement of the density of urine compared to pure water. For routine clinical purposes, USG is determined using a refractometer (refractive index generally correlates well with USG). USG is influenced by the number of molecules in urine, as well as their molecular weight and size, therefore it only approximates solute concentration. It is also affected by temperature, with urine density decreasing (lower USG) with increasing temperatures. The presence of large amounts of protein and glucose will alter the USG and should be considered when interpreting USG results. Note, that the above values were obtained from the textbook co-authored by Stockham and Scott (Fundamentals in Veterinary Clinical Pathology). Also, the effect of these substances on USG does depend on the refractometer, some of which are more accurate than others (Tvedten et al 2015). Cornell University uses a temperature-compensated Reichert refractometer currently for USG measurements in animals. Indicated below are guidelines for interpreting the USG in animals. Note that different cut-offs for “adequate” concentrating ability and isosthenuria are reported in the literature. Given below are the ones used here at Cornell University. “Adequate” USG: The “adequate” USG or concentrating ability column is used specifically in azotemic animals. In this context, an “adequate” USG indicates the existence of sufficient functional nephrons to adequately concentrate the urine and to prevent development of azotemia, provided that renal blood flow is sufficient and that the ability of those nephrons to concentrate urine is not impaired by other factors, such as medullary solute washout (see above and renal physiology page), an adequate USG in an azotemic animal usually indicates a pre-renal azotemia. “Inadequate” USG: In azotemic animals with primary nephropathies characterized by progressive loss of of functional nephrons, the ability to concentrate urine is compromised when about two-thirds of the nephron mass is lost. However, clearance of nitrogenous waste products sufficient to prevent azotemia, persists until roughly three-quarters of functional nephrons are lost. Therefore, if azotemia is due to loss of nephron mass (> three-quarters loss, i.e., renal failure), ability to concentrate urine will have already been lost (i.e. the USG will be less than “adequate” for that species). An exception to this occurs in cats, in which glomerular disease (and azotemia) can precede loss of concentrating ability. Thus, an “inadequate” USG in an azotemic animal is compatible with renal disease and a renal azotemia unless there are other factors that impair the ability of the kidney to concentrate, including decreased hypertonicity of the medullary interstitium and inhibition of ADH (see above and renal physiology page). Isosthenuria: In a primary renal azotemia, the kidney cannot concentrate or dilute urine, so there is often a fixed (constant) isosthenuric USG, i.e. USG of 1.008-1.012. However, in renal disease, the total loss of renal tubule function occurs gradually, therefore USGs between isosthenuric and “adequate” ranges in animals with dehydration and/or azotemia, are highly suggestive of primary renal failure. Hyposthenuria: Hyposthenuria indicates that the kidney can dilute the urine but is unable to concentrate, i.e. 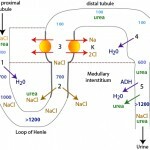 proximal renal tubule and loop of Henle function is retained but the tubules are unresponsive to ADH, either from a primary ADH deficiency (central diabetes insipidus) or lack of responsiveness of renal tubules to ADH due to renal tubular disease or inhibitors of ADH (nephrogenic diabetes insipidus). Urine osmolality is directly related to the number of particles in solution and is unaffected by molecular weight and size. For this reason, osmolality is superior to specific gravity, which is affected by particle weight and size. Osmolality can be measured by freezing point depression (the technique used at the Clinical Pathology Laboratory of the Animal Health Diagnostic Center at Cornell University) and changes in vapor pressure. Urine osmolality can also be approximated from the USG. This is calculated by multiplying the last two digits of the USG by 36.